This neat collection of Tiny Turbo scale hot rods comes from Flickr’s Jonathan Elliott, and they’re all waiting outside the diner for a ride. * Take your pick and hop in at the link above. 4-wide cars, officially named ‘Tiny Turbos’, are like the Hot Wheels or Matchbox cars for Lego fans. I am a big fan of these tiny models and I’m always looking for new ones. Lots of them don’t really look like the original model, but every now and then comes a new model you can recognise at the first look. In this case it’s Ken Block’s heavily modified, 4-wheel driven 1965 Ford Mustang called “Hoonicorn”. The car is the star vehicle in Block’s Gymkhana 7 video and is mainly built to burn rubber. Flickr’s DerLuckyy is the builder of this ‘Tiny Turbo’ and the small thing really looks like the original, including custom-made stickers, big wheel houses and a huge diffusor. You can find these and some more pictures of the model on Flickr. 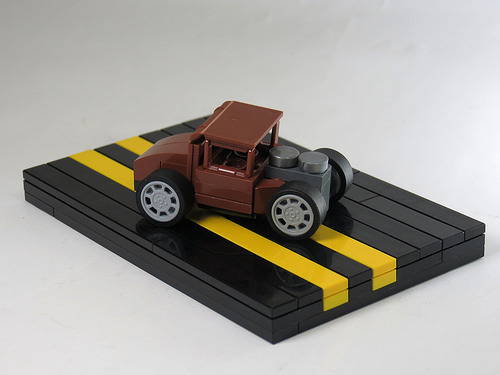 You only need a few bricks and a few good pictures to build your own version of the LEGO model… Vroom – Vroom!!! Thanks to Nils for joining us today, and he’s absolutely right; a few well-chosen bricks and some good photography is all that’s needed to make a splash in the Lego Community. If you’re an observer here at TLCB and yet to try building for yourself, give it a go! Anyway, that reminder of everything that was wrong with 1980s music bundled up into one abhorrent noise does lead nicely onto today’s creation. Because it really ain’t what you do, it’s the way that do you it. Tommy ñ‘s micro-scale racing car may only be made from a few pieces, but it’s a startlingly effective design. Tommy has also photographed his model beautifully – as you can see above – and the result demonstrates wonderfully how you don’t need a million pieces to create something that could appear here. You can check out more of Tommy’s micro-scale racing car, and his other small-scale vehicles, at his Flickr photostream – click the link above to make the jump. *Because we’re suffering you have to too. Who would have thought that you could use Lego horns as wing mirrors? Flickr’s RGB900 did and remembered to put them on his car too. Time to open up the red Smarties. The appropriately named Vinny Turbo has just uploaded a load of new builds onto his MOCpages and Flickr accounts. Unfortunately this has resulted in a disorderly hoard of Elves stampeding into The Lego Car Blog offices and demanding Smarties of all sorts of colours. After dispersing our chaotic co-workers with a liberal use of Mister Airhorn, we’ve chosen a couple of the best to share with you. At the top of this post is the Integra, a re-worked version of an earlier car, which now comes with adjustable front Bat-spoiler. At the bottom of this post is the sleek and refined VTS V10, which features some interesting SNOT bodywork. Also worth a look are the Bentrolls Steam Cloud limousine and the VTS Edge with its curvaceous black body. Click on the links in the text to see more of Vinny’s work. Another day, another Elf, and another MOC to bring you. This 5-wide named ‘Poison Ivy’ is the work of Flickr’s Vinny Turbo, and you can see more here. Today we bring you what Drome Racers would’ve looked like if it were a series about Tiny Turbo supercars. 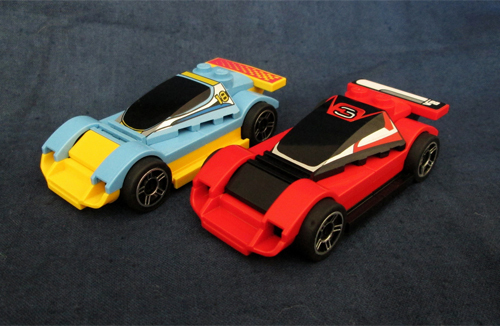 Count Sepulchure’s pint-sized racecars, numbers 3 and 18, use some early 2000s printed pieces to create a very retro-feeling pair of supercar-esque creations that you should definitely check out. You can see more of the Count’s work over on Flickr (no relation to the Sesame Street character, though how we wish there could be). 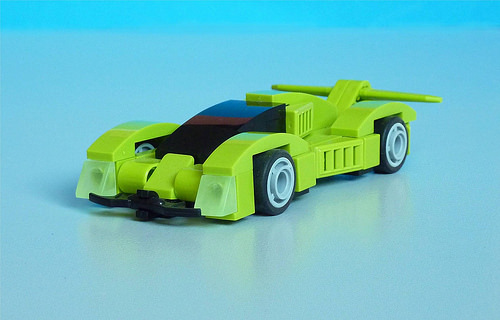 It’s not often that one of the Lego community’s most diminutive vehicle scales – Tiny Turbo – puts detail on full-scale models to shame, but every now and then one does. This GTR by Tommy ñ over on Flickr has enough intakes, greebles, and realistic details to go toe-to-toe with models tens of times its size (and look good doing it). You can check out this and more of Tommy ñ’s cars over on Flickr. Like The Lego Car Blog Elves, Vinnie Turbo’s models are small and simple. Unlike the Elves though, they’re great to look at. Plus they probably don’t try to kill each other every time his back is turned. Here we feature two of Vinnie’s latest designs, and you can see many more at his photostream here. 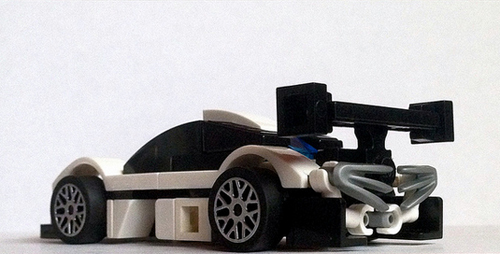 We round off the working week here at The Lego Car Blog with two diminutive models that prove small can be beautiful. 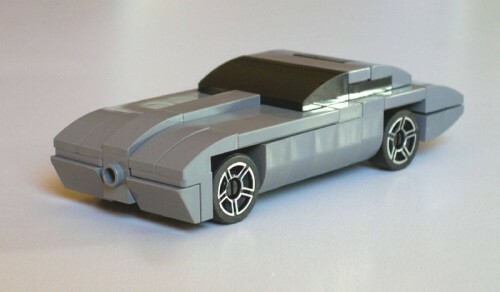 First (above) is previous TLCB bloggee Angka Utama‘s modular-build GTO, with interchangeable chassis and bodywork designs. You can see how it works on Flickr at the link above. Second (below) is a model that comes from another builder who’s featured here before, the brilliant Chris Elliott. Chris has a rapidly expanding portfolio of beautifully presented fictional 1960s vehicles, the latest of which is the ‘Volvexa Songbird’ shown here. The name may sound like it belongs on a feminine hygiene product, but the model is wonderful. You can check out the Songbird and Chris’ other works on Flickr at the link above. We don’t often post ‘Tiny Turbo’s here at TLCB. Mostly this is because they tend to be rubbish, so it’s a brave Elf that returns to the TLCB Towers with a ‘TT’ creation, as more often than not they are rewarded with a slap and a trip out the window courtesy of the office sling-shot. Not today though, because the brave Elf that brought us this was right on-the-money. This, kids, is how a Tiny Turbo should look. Built by Flickr’s delta triangle, it’s a hill climb special complete with some simple yet wonderfully effective ‘aero’ and a host of night-time spotlights. Plus it’s rockin’ what might be LEGO’s best colour. Check out the images on Flickr at the link above, whilst we give a brave Elf a blue Smartie. Found on MOCpages, Starscream Soundwave’s ‘American Cruiser‘ is yellow, low and seriously smooth. This little FSO Polonez made by Flickr user r a p h y is a birthday present to his brother, who owns the real-life version of this LEGO model. Talk about original presents! Using some cool techniques and basic pieces Raphy nails the Polonez look in a tiny scale. Great work Raphy!